Mommy bullies are the worst of the bunch! Just when you thought people could not be any more repulsive, along comes a gem like this. I belong to a mother’s group on social media and today one of my fellow mothers put this on the wall. 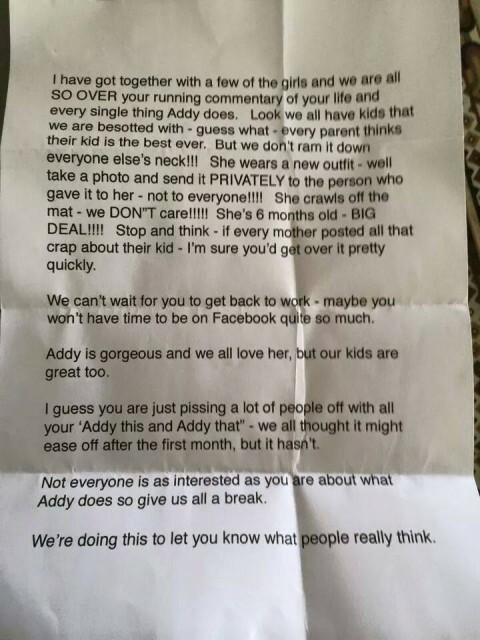 A friend of hers, who is a new mother, was sent this horrifying letter by a mean girl (and a few of her cronies if we believe that she is representing a group of mothers as she claims). At first when I read it, I thought it can’t be real. Surely no one who calls themself a friend would ever write this to anyone? Surely there are other ways of dealing with your annoyance at this mom’s obvious pleasure and pride? My first instinct was to say, why don’t you just unfollow her? Why don’t you just unfriend her if you don’t want to see her baby news updates? Surely that would be the kinder option…or grow a pair and pick up the phone to talk about it..better yet, pop round for a visit and be brave enough to talk to her if it is such an issue for you. When did being a mother become something by which we have to abide by a set of rules imposed by other mothers? Mothers are so quick to judge. It is sad…at a time when women need each other, need the support of those who are going through similar experiences, that some feel the need to bring each other down. Why should she care if you don’t like her updates? Why should she modify her updates to please you? Why should she care what you think? 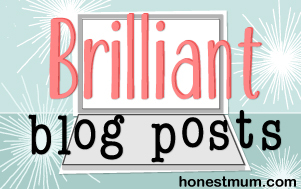 When did sharing images, anecdotes and updates about our offspring become offensive to others? I have 3 children. I share pics and anecdotes of them almost daily. Why? Because we live far away from family. It is our way of connecting with grandparents and other family members who we only see very rarely. They do care when my child loses a tooth. They do care when they get good results at school. They do care when my children do something funny/silly/cute. They do care when my child reaches another developmental milestone. My local friends can unfollow if they find it too much…I’m not doing it for them. For a friend to say “we don’t care” points to a major character flaw. If she was true friend, she would care. She would delight in these moments (or at least pretend to) with you. She would press ‘like’ to show you she cares about you (even if she finds the volume of updates excessive). True friends don’t say “we don’t care”. Not ever. Why should a new mother be made to feel she is doing something wrong just because she is sharing her joy and the novelty of this new little person in her life? She shouldn’t. That’s the point. The writer of this letter is plain simply a mean girl! I feel sad for her children. I feel sad that they will grow up with a mother who belittles, diminishes and feels it’s okay to be downright rude to someone anyone, not the least someone who is a friend. What kind of role model is she? She is quite possibly raising the next generation of mean girls. She calls the things that children do “crap”. How sad for her. My children’s milestones are anything but “crap”. They are glorious, exciting, momentous, mommy-pride-inducing, and a whole lots of other positive adjectives, BUT never “crap”. I wonder what her children will think when they realise that their mother thought all their cuteness, achievements and milestones were “crap” and not worth sharing. The line about not being able to wait for her to get back to work so that she has less time on Facebook, really gets to me! What the? The writer of this letter is wicked (and not in the good way). Who says that to a mom who is home caring for her new baby? Possibly someone who is jealous. Someone who has guilt for not staying home with her own offspring? Someone who does not revel in her role as mother? Who knows what the reason is. I do know that she will be the loser in the end. Toxic people are never happy. My guess is that she isn’t happy, why else would she be so concerned with someones happy baby news related status updates? I read with interest what the other mothers who were following the comment thread had written. Their reactions were all unanimously one of pity and sympathy for the mom who got this letter and ranging from rage, to disgust to vindictiveness aimed at the writer. They offered ideas for revenge or public shaming, they showed solidarity by posting images of their offspring, they planned ways to spam the writer’s page. I could totally identify with them. I had some of the same thoughts. Then I thought, once you put it out there, especially in cyberspace, you can never take it back. And I don’t want to be that person. I want to live the way I want my children to live. To be a positive role model so that once day my children will also think about their actions and the effect that words and deeds can have on others. I too offered my sympathy and voiced my disgust but I won’t be adding any venom. This person is toxic. She exudes toxic traits. She is ugly on the inside. She is NOT worth my time or consideration. And she shouldn’t be worth anyone elses either. 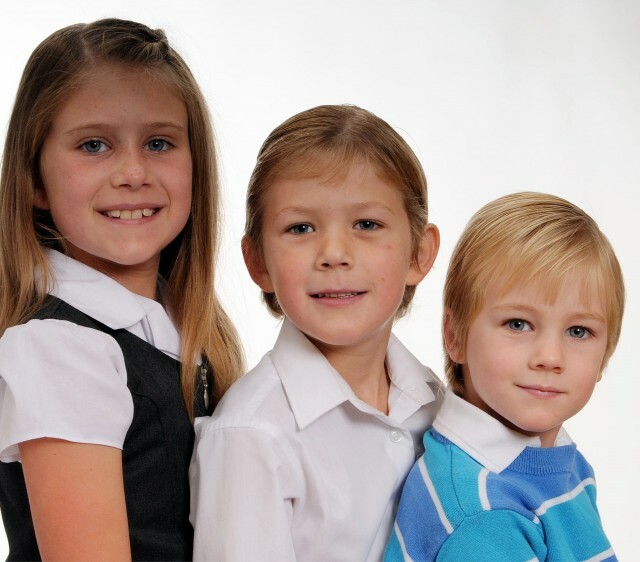 And just to make a point, here are my three little people. I’m immensely proud of them. I love them to bits and will happily post dozens of updates about them for as long as I am their mother. You don’t have to look if you don’t want to!